Frozen is not my favorite movie: Why I think the Croods and Despicable Me are better family movies. We recently were able to rent the Disney movie Frozen that everyone was talking about. I heard great things about the story and how wonderful the soundtrack is, saw the many posts on face book, the videos of parents singing the "Let It Go," song, heard about how movie, soundtrack, and rentals were topping the charts. Two of my kids had actually been to the theater with friends to see it. They thought it was pretty good. When we sat down to watch the movie I was ready to be entertained. -Loved the castle, the setting, the cute sisters, the magic. Then, frustrated. Dumbfounded. Confused. And I couldn't get past it. What powerful, beautiful, prosperous kingdom, leaves two little princesses alone with just three people. That's it, right? The cook, the butler, and some one else? What? What is that? Now I don't expect cartoons to always have to measure up to reality, but this was just...where are the adults? These parents have this special child and they don't have special teachers? No one else had ever been able to do this? Where does the magic come from? Why not bring the rock toll's home to train her, or leave her there over the summers? Two little girls alone? WHERE THE HECK ARE THE ADULTS? No relatives? No court advisers? No special council? How did this kingdom not get taken over when the parents died? Who paid the bills? Who made decisions? Where is the military? And then Elsa runs off, by herself, and her younger, very naive sister goes after her. Alone? WHAT IS THAT? Is this suppose to be a lesson in female bravery and independence or is it just plain immature female stupidity? Who goes into the snowy frozen mountains alone? Can you say person popsicle? Can you say avalanche? And who lets a girl who has never left the castle go into the mountain wilderness ALONE? Can you see me pulling my hair out? Now I love make-believe. I love make-believe and fantasy stories. I enjoy most Disney films. But some of Disney's princess films really, really bug me. Ariel was only 16 and she repeatedly disobeyed her father almost destroying the underwater kingdom by bargaining, (naively and stupidly,) with a witch. But she still gets her happily ever after. Belle promised to stay in the castle with the Beast but the first time Beast acts like a Beast she (naively and stupidly,) runs away in a temper tantrum alone and almost gets herself and the Beast killed. Those are the two that pop to mind. I do enjoy fantasy but good fantasy has to be cohesive, it is believable -there is a fancy word I am looking for that I can't think of right now- good fiction creates a whole new believable world. The world of Frozen makes no sense to me. It is not believable. Another movie we rented a while ago was the Croods. I will tell you, I had many opportunities to watch this too, but there was nothing else to watch so I tried it out. I thought it would be dumb. It looked dumb. There was another animated movie that looked dumb in the trailers too, Despicable Me. My husband saw that part with the fat kid and his fat parents vacationing and it turned him off. But with nothing else out there for families, we eventually watched it. And we ended up loving both of them for pretty much the same reason. 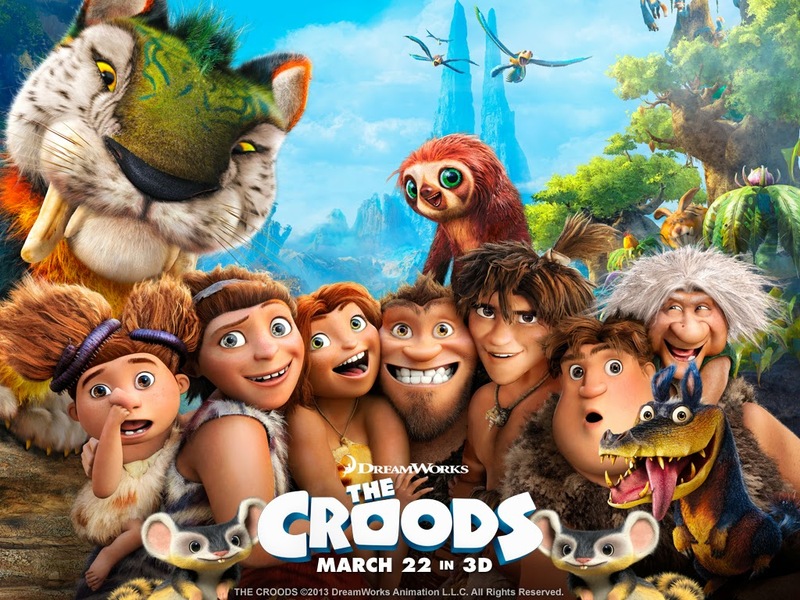 Despite the nonsensical prehistoric background and creatures, the Croods has a believable, relate-able family. Dad may not have been a creative thinker, but he took his roll as protector and provider very seriously. He had reasonable rules in place so that he could keep them protected. He had a great relationship with his wife, and a predictable relationship with his mother-in law, but his daughter was growing up and that distressed him, the same way it would distress most father's. When a stranger appears and the end of the world seems to be occurring, Dad behaves predictably. We thought it might be another one of those kids shows that makes the parents look stupid ( we avoid those kinds of shows in our house) but if you watch to the end, the family needs Dad, and all that he is, to save the day. This is a story of a family. The daughter, Eep, is actually a pretty good role model. She is strong, quick, and rather remarkable. You can see her parents in her, especially her father. She tries to stretch Dad's rules a bit, but she knows that they are more than reasonable rules. She wants more from life, but she knows it would be stupid to try to get it alone. Despicable Me is about a bad guy who has no love in his life. He tries to use three orphan girls in a despicable plot, but ends up falling in love with them. It's a story of family. The Croods and Despicable Me have no princesses. Two through Five year old girls will not be role playing these movies or singing the songs. But they are more believable, a better representation of family, have strong male role models and good examples for girls too. We won't be buying a copy of Frozen or renting it again. But I know on a rainy day, we will be watching the other movies again, the kids will be saying all the funny parts along with the characters, and we will know that the whole movie teaches positive family values. I believe the phrase you are looking for is suspension of disbelief? And while I might infer that a major part of the plot was the error in judgement on the part of the parents, that could not be corrected later as result of their death, I think your point is still well taken. Love your heading. Did you draw that yourself? None of the movies have I seen and probably won't as I'm really not a movie person, but I delighted in your narration of them. Yes, a family and good role models are important.